How to Make Granola Yoghurt Tart- Hello everybody, welcome back with ZetiraKitchen! 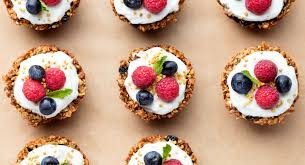 Today i will share about How to Make Granola Yoghurt Tart. The Granola Yoghurt Tart is so easy to make. You just must mix the ingredients for the tart and bake it in short time. Then you can add your smooth yoghurt in the middle of tart. Decorate your granola yoghurt tart with add some your favourite fruits. Granola has many benefits for us. This cake is one of the healthiest snacks because the ingredients used have high fiber content. So let's make it! for topping strawberries, raspberries, blueberries, or your favorite fruits. Put oats, nuts, seeds, melted oil, honey, vanilla and cinnamon together in a bowl. Then mix until mixture. Take 3 tablespoons of the mixture into greased mini tart then press in all side using the back of an oiled spoon. Bake in oven for about 15-17 minutes, until the colour golden. Remove the tart from the oven, use the back of the spoon to press down the centers of the crust to create more of an indentation, and push up the sides. The shell puffs up in the oven, so it helps to reshape the crust after it bakes while still hot. Let it sit until cool. Use a small knife to gently release the sides of the crust, working in all side, then very carefully remove it from the pan, turning over if needed into your hand. Fill tart 3 to 4 tablespoons yogurt for one of tart. Add fruits on top of yoghurt.